"The sloppy joe mix in this pizza casserole gives it an excellent flavor." Place the beef in a skillet over medium heat. Cook until evenly brown. Drain grease. Mix in sloppy joe seasoning. 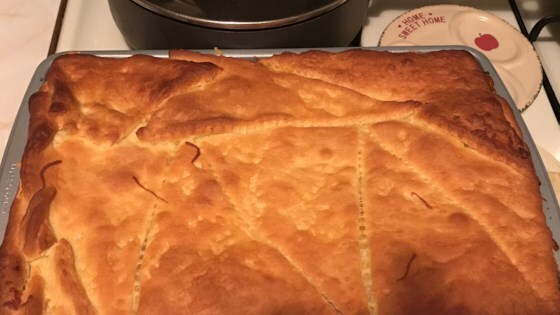 Press 1 can of refrigerated crescent roll dough in the bottom of a 9x13 inch baking dish. Layer with ground beef. Sprinkle mozzarella cheese and Cheddar cheese over beef. Spread evenly with sauce. Top with remaining crescent roll dough. Bake 40 minutes in the preheated oven, until top is golden brown. Everything you love about pizza in a simple casserole. My family loves pizza and even sloppy joes but this was just too much. It just wasn't good. I wouldn't recommend it. We added pepperoni to this recipe, just under the top crust. It was excellent, my husband and I loved it. Thank you. Easy kid-friendly dish. I will make again. This made a great meal for my family. They loved it. I added a little extra cheese and also used Manwich instead of the seasoning packet. Super easy and even more filling! !